The game Medal of Honor is a PlayStation video game series produced by EA Games that features multiple installments. 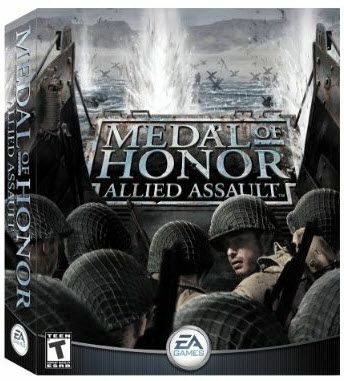 The first 12 installments feature World War II, and Medal of Honor: Allied Assault is the third game in the series released for the PC in 2002. It's in the genre of "first-person shooter" (FPS) video games, meaning that the point of view is first person, i.e. you, the player, are the main character. Medal of Honor: Allied Assault has two separate demos, one for a single-player and one for multi-players. In the single-player demo, Lt. Mike Powell leads missions behind enemy lines to destroy a Nebelwerfer 41 six-barreled rocket launcher. The multiplayer demo contains one map playable in one of the four gameplay modes that are included in the full version of the game. CNET reports that this file is 133MG and is intended for operating systems Windows 95/98/Me/2000/XP. If you have a later operating system, it will still likely work but is not guaranteed. Softonic reports that this file is 183.76MG and is intended for Windows 95. This site provides no additional information. This site is a non-profit sharing site, meaning that users upload files for others to download. While downloading from sharing sites can be unsafe, McAfee Site Advisor has deemed this website safe. Warning: Many download sites, such as CNET and Softonic, include third-party utilities and applications bundled by default into a download. Some of these switch your default browser and preferences or may take control of other computer functions as well. Be careful when downloading software, and read all the fine print to avoid installing programs (such as adware or malware) you don't want.